I was visiting Ravelry - the "We Love Lucy" part, and another person posted a photo of a crocheted heart ornament similar to one I've made for years. I showed my heart and some of the ladies asked if I had a pattern to share. Well... I've meant to make a pattern for this for years as I just love this ornament and have made hundreds over the years. They decorate my tree and I give them as gifts. 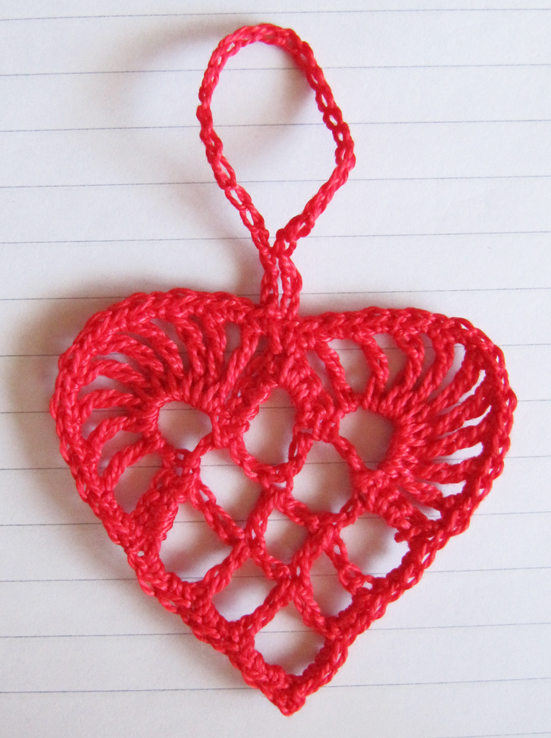 So, I decided to crochet a heart and write up the instructions as I went along, and I also photographed the progress - and they typed it all up, added the photos and made a PDF. So, here is my gift to you! Please let me know if you try this and there is a mistake in the directions, it was my first try at doing this. The heart is beautiful! I can see some hanging from my tree this Christmas. Thank you for sharing. I saw your heart on knitpurlgirl.com and I love it I made one right away and it was so simple. Thanks so much. by the way, the colour is '666' and not '999'- after spending ages trying to find it I realised that! Hello! I just stumbled onto this after searching Google for Scandinavian Heart crochet patterns. Unfortunately, the link to the pattern no longer works. Is there a way to get the link to this pattern working again? Or another way I can get this pattern? Thanks!